Enter Wiki-based event page: http://www.copswiki.org/Common/A29SanOnofreProtestAndRally -- Latest updates to this page. 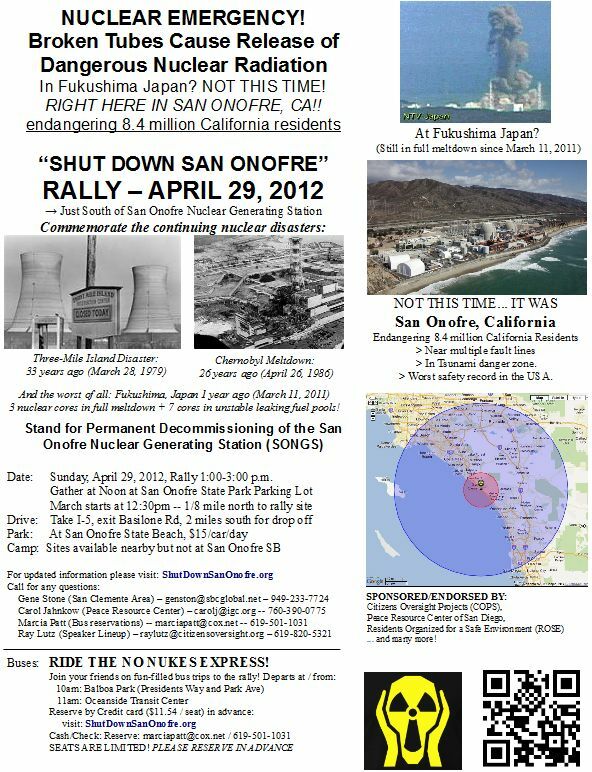 Enter Wiki-based project page: http://www.copswiki.org/Common/ShutSanOnofre -- Includes media, timeline, etc. Three Mile Island! Chernobyl! Fukushima! San Onofre? Rally to Shut SONGS, Sunday, April 29, 2012. DID YOU MISS OUR LAST EVENT? See info about it: Fukushima Remembered including news reports, media coverage, video recordings, etc. If they try to restart the plant, please be ready for immediate action. This plant must never restart! Note: Rally Site will be monitored for ANY radiation danger -- will not hold the event unless it is safe! Cathy Iwane -- From Wakayama Prefecture Japan to give us an update on Fukushima. Date: April 29, 2012, 1:00-3:00 p.m.
Drive: Take I-5 to Basilone Rd, Drive 2 miles south for drop off. 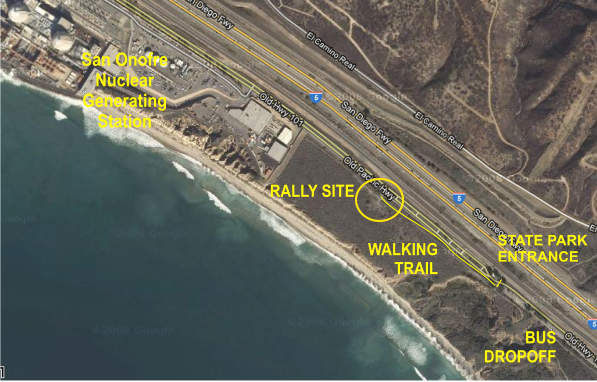 Park: At San Onofre State Beach, 1/8 mile south of Rally Site -- $15/day -- Please bring correct cash. Two other nearby campgrounds are open for camping: San Mateo Campground and San Clemente State Park ($35/night). March:	Starts at 12:30p From State Beach Parking area, 1/8 mile to rally site, bring signs, etc. NO FUKUSHIMA/CHERNOBYL USA! -- KEEP IT SHUT DOWN. SAFETY BEFORE PROFITS FOR SCE.